Posted by Marguerite	| November 21, 2016	. I am grateful for my clients and very thankful that I can do what I enjoy for a living. Being self-employed can be challenging at times, but I truly love being an entrepreneur. Please checkout the deals I am offering to my local clients in the Homewood, Illinois area. Come get a relaxing massage and let me help you with any issues massage can help such as tight shoulders, neck, painful knees, hips, feet. You just let me know where you need the healing touch. See the TESTIMONIALS clients have left on my Spa site. Also, checkout this great offer from this amazing artist who has released her 2017 calendar. 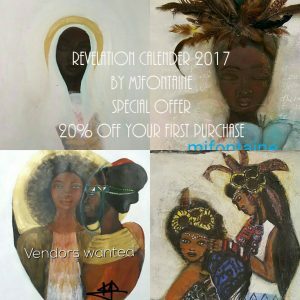 Revelation Calendar by MFontaine, fellow Healing Artist and Visual Artist. Her work is amazing. Go to this link and type in my code: STSPA2017 for 20% OFF!! !